Don't you just love a comfy pair of denim? Especially when you are just shy of 6 feet tall and they are the perfect length with heels! WooHoo!! This top from target is awesome with the vegan leather details on the shoulders and the hi/low style. Paired them both with all the bright orange accessories and it really makes a simple, chic outfit come alive. 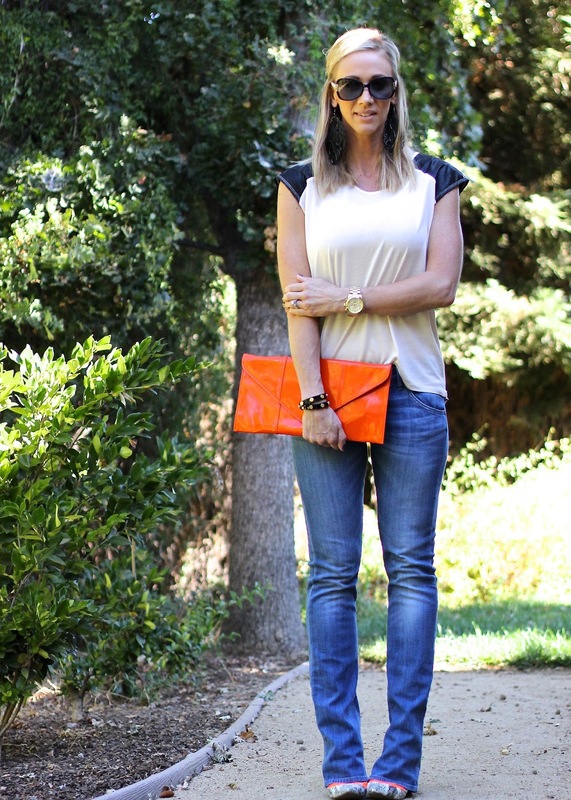 Plus don't you just love a little orange to put you in the fall spirit?! I sure do. Do you have a hard time finding the right length for denim? Are you tall too or short and have to hem? THOSE EARRINGS! MUST HAVE NOW!!! Love this casual chic look!!! Gorgeous and yes I have a hard time finding the "perfect" length, I usually have to get my pants hemmed which is so annoying!!! Very causal chic outfit! I love it! And I am especially with your clutch, the color is beautiful. I freaking love orange! Who takes your photos for you? They look so good! Such a cute bag!!! Love it! great look. I also adore the orange pop of color! Nothing like a good pair of jeans- right? These look killer on you. Loving the orange touches!